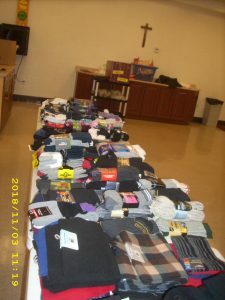 In preparation for winter, members of Most Precious Blood Parish Council (Windsor, Ontario) invited parishioners to donate socks, hats, and mittens for the homeless. Once sorted, four 8-foot tables were generosity loaded with goods. The items were delivered to three homeless centres in Windsor.